Seneca College College may request Faculty/Staff/Student pictures to be used for official college business. To have your college ID card ready for you upon your arrival, we ask that you submit a digital color photo. You can upload a color snapshot showing a full front view of your head and shoulders according to the requirements shown on this site. By using this process you will avoid lines and save valuable time. Once your photo is received/approved, you will be notified and provided a date/time to pick up your new ID card. 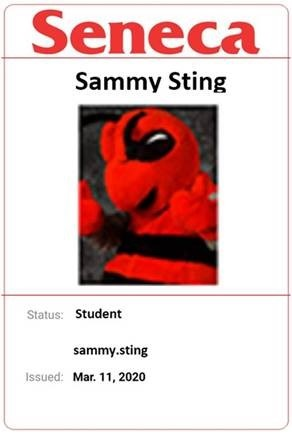 By submitting this photo for your ID you agree this photo may be used by the Office of Student Activities and Co-Curricular Programs to update your student records. Please contact our office if you have questions about this policy at 416.491.5050 or onecard@senecacollege.ca. New students who submit their photo through MyPhoto by 5pm on May 3rd will receive a $2 OneCard credit (not redeemable for a cash value). OneCard is accepted at most Dining Services and retail locations on campus.